Today on the YarnThing Podcast with Marly Bird: Crochet expert Tammy Hildebrand! Listen in below to hear Marly and Tammy talk about how Tammy got started, her books, designs and lots of other things! Tammy learned to crochet from one of her teachers when she (her teacher) offered to teach anyone who wanted to stay after school to learn. Tammy has kept going since and still has that first floppy purple hippy hat she made. Before she made it in the yarn industry, Tammy worked in a customs house where she met her husband, a truck driver. After moving around the country (and Canada), she became a stay-at-home mom. She got into designing when she saw an add in the paper for contract crocheting for Maggie Weldon. After several months of contract crocheting, Tammy decided she could do the designing too and went for it. Her first design was a soap holder and appeared in Crochet World. Sending in swatches and proposals left and right (quite a few for one book in particular), she made her way in to the industry and has now been published in many places including the magizines Interweave Crochet, Crochet!, Crochet World, and Crochet 1-2-3 as well as with various yarn manufacturers and distributors. Tammy is also involved in the Crochet Guild of America. She started going to the guild conferences when she was contract crocheting and has been to every conference since. Now, she is Vice President of the Guild and previously served as the professional development chairperson and the mentor coordinator. She also participates in the mentor program herself, which matches up new designers/crocheters with an established professional. Tammy has several published books the newest of which just came out and is called Crochet Wraps Every Which Way. The book has 18 designs that use 6 basic techniques to make wearable wraps. Some of the designs are show below and you can see the book and patterns here (Rav link). Tammy also has another book coming out this year, Crochet for Baby All Year, which has a baby outfit themed for every month of the year and they are cute! In addition to books and magazines, Tammy publishes with yarn companies like Red Heart and online with websites/companies like Knit Picks. And we can’t forget the GIVEAWAY! As always, leave a comment below with Tammy’s keyword for your chance to win! So enjoyed your appearance on the show and hearing about your granddaughter Willow. As a crocheter and a new grandmother this is a book I’d love to have on my shelf. What a great show, with lots of useful information from a real expert crocheter. Thanks to Tammy for sharing your experience, your story, and your love for your granddaughter, Willow. The book looks and sounds great. Willow is a fabulous name. Thoroughly enjoyed the interview! 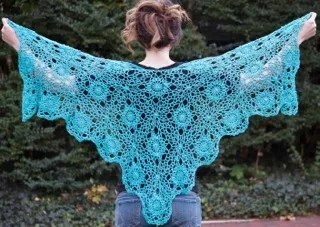 I loved listening to you share your success story in to the crochet world, I hope Willow will follow in your footsteps. Willow is a great name. It reminds me of the Willow yarn line. I was reminded to leave my comment as I passed Willow Pond Road. I really enjoyed the conversation with Tammy. I am eager to look up more of her designs. I love willows, growing up my grandmother had a huge one in her yard that i used to lay under and read. Willow is such a lovely name. I love how you joined your love of family and your love of crochet by nameing a design after your granddaughter, brilliant! My daughter who has been married less than two years is waiting to have children but is already thinking of names. I find that so funny. Just hope I like it. Willow is a beautiful name. Has your granddaughter seen Louisa Harding’s Willow Tweed. How cool to crochet something with your name in the title. Like it was made just for you. Now I know of 2 designers with a granddaughter or daughter named Willow! Listen to Tammy, Marly, and go to the Chain Link conference. I’ve only been able to go to one, but it was the most fun I’ve ever had. Love Willow!! Great show as always! My aunt has a beautiful willow tree on her property, and I know a beautiful little girl named Willow as well.